Eighteen months of meticulous work using the original drawings and construction techniques resulted in the G.L. Watson & Co. designed classic yacht St Patrick being returned to the same condition as she sailed from the William Fife yard just over 92 years ago. 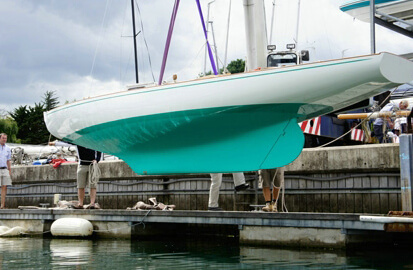 The now restored St Patrick is finely detailed and re-emerged from Fairlie Restorations’ shed in Hamble as the cutting edge racing yacht she was. Extremely lightly built and resplendent in her original livery of white and green with re-plated nickel fittings, the yacht looks every bit the 1920s racer. The successful completion of the restoration of St Patrick was achieved thanks to a close collaboration between G. L. Watson & Co. and Fairlie Restorations who specialise in the restoration of yachts built at William Fife’s celebrated yard. In a real sense the collaboration that originally gave St Patrick such a fine pedigree has been repeated for the 21st century.